The deadline for ICD-10 implementation is on its way. Practices and eligible providers need to prepare for the transition and take a proactive approach to the implementation. Even with the recent announcement from CMS declaring the first year as a grace period which compensates the auditing of claims and that of quality report processing during the ICD-10 transition, the following steps can be used as a checklist to ensure your practice stays on track starting October 1, 2015 onwards. The first step is to fully understand the differences between ICD-10 and ICD-9 and the effect they have on the specialty of a clinician and your entire organization. Going over the ICD-10 “Official Guidelines for Coding and Reporting” is a good start. Divide the work that needs to be completed by including staff members from the clinical and administrative departments of your practice. It is important that the changes necessitated by ICD-10 are properly communicated from both a workflow point of view and clinical documentation standpoint. 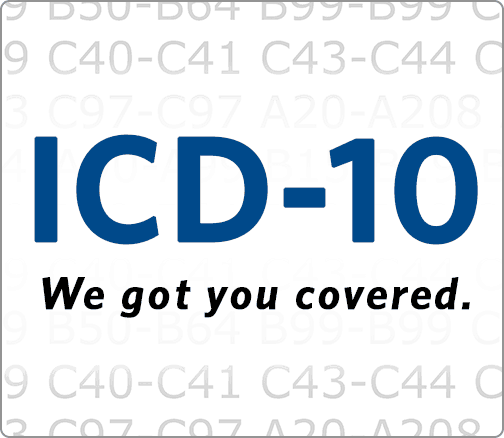 To ensure your practice is ready for ICD-10 implementation, you must take all the systems you use into consideration. Ensure you include the businesses that your practice exchanges data with (both paper-based & electronic) along with the workflow processes that initiate the billing process and clinical encounters. Be sure to ask your vendors if they require upgrades in order to utilize ICD-10 and if they will require any training along with the costs associated with both. It’s also advisable to ask about employing ICD-9 and ICD-10 simultaneously and how long such a scenario would be applicable. When developing your budget, be sure to incorporate the costs of both software and hardware upgrades, training costs, education costs, cost of hiring temporary staff during the transition (if required), alterations made in printed material, time-cost of reviewing documentation and finally the cost associated with lost coder, revenue cycle and/or clinical staff productivity. Ask them if they’ve upgraded their systems to put up ICD-10. If, for some reason, they have not then ask them when it will be ready. Be sure to ask them how they will be helping your practice with the ICD-10 transition. You can also ask them when your practice will be able to test out claims and any other relevant transitions with the ICD-10 codes and whether or not you’ll receive a list of data content changes provided by them. It’s also important that you ask them about associated health plans and when the payment changes are expected to be announced. Clinical documentation may be the most difficult aspect of ICD-10. When you crosswalk ICD-9 codes to ICD-10 codes, you’ll be able to determine issues with the documentation. The objective is that you should be able to identify gaps that make it impossible for coders to select the correct ICD-10 code. Determine any education needs that your practice lacks. Everyone in your practice needs to be trained, but not necessarily at the same level. Determine the staff members who need training and on what. Identifying training modes for all of the groups and the timeframe in which they will be trained is crucial. Testing out your system is a surefire way to ensure successful implementation. Conduct tests for both external and internal testing scenarios. Testing should always be scheduled so it’s best to get a head start.